Lou Smith rides with the boys junior varsity. Ethan Tenderholt rides with boys junior varsity. Alex Gohr, back, rides with the boys junior varsity. Caleb Owens rides with the junior varsity boys. Ryan Bishop, left, on the podium for his fifth-place win. Amanda Edwards, far right, is on the podium for her fourth-place win. Grace Garrett rides with the freshmen girls. Ayden Montgomery rides with the sixth-grade boys. Spencer Theriault rides with the sixth-grade boys. Ryan Saltzman rides with the seventh-grade boys. Caleb Owens rides with the boys junior varsity. Freshman Grace Garrett, at right. Austin Garrett rides with boys junior varsity. Alex Gohr rides with the junior varsity boys. Lou Smith rides with the junior varsity boys. 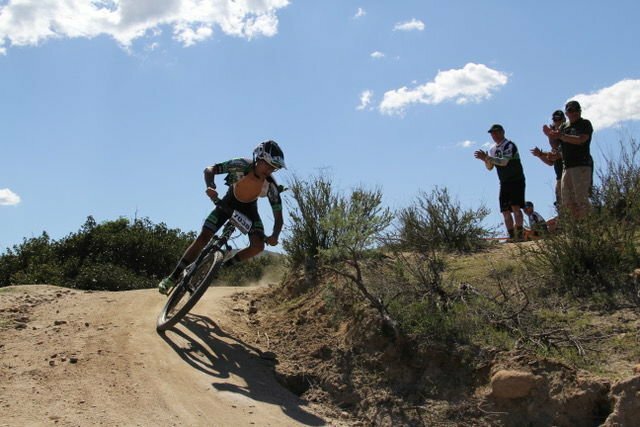 Tehachapi mountain bike team had its second race of the season March 16 and 17. There were 990 Southern California riders registered. Our team brought home one fourth-place medal and one fifth-place medal and once again many top finishers. Heritage Oak School received a second-place award for highest points in their division. California is never short of beauty and Vail Lake displayed it proudly. Hundreds of riders and spectators poured into a tree-covered valley, which was surrounded by green hills, orange poppies and a stunning backdrop of snowcapped mountains and blue skies. While beautiful, reports showed a high of 90 degrees on the race course. This is nearly a 50-degree shift for our local students who have been bombarded with snow, wind and freezing temperatures. Saturday morning crowds chanted to a 10-second countdown as rows of young middle school racers gripped their handlebars, placed one foot on their pedal and prepared to tackle the mountain. Dust clouded the start as the riders faded off into the mountains. Spectators rang bells and cheered them on as they passed, then dispersed to find the perfect spot to watch their riders push through their laps. Middle school races 7.5 to 11 miles depending on their level. Vail Lake has a reputation for steep choppy hills and fast drops. The dry, loose dirt showed no mercy to gripping tires as they raced around every turn. Our Tehachapi riders rode every bit with confidence and determination to finish and to finish well. Our top middle school rider of the day was Amanda Edwards, finishing in fourth place. On her last race she came in 22nd. One might speculate that a change in bikes or being staged on the front of the start is what got her to the podium, but what brought Edwards to the top is that she didn’t give up. She showed up for practices, she rode hard and regardless of her past finish and a broken bike, she continued to race. Edwards is a great example of what can happen when one perseveres. Sunday started early with the high school riders. We have 19 students representing Tehachapi. Five of them are new to the team and to racing. All rode hard. As the second race weekend has passed, each of them has shown a drastic move in places; some climbed as many as 17 spots. This year they are fighting not only to take a spot on the podium, but also to finish top 12. Being top 12 guarantees them a place at the state finals. It gives them an opportunity to ride against the NorCal league and stand on the podium as California’s top rider. While all rode well, our top high school finishers of the day were Ryan Bishop, fifth; Sophia Schaeffer, seventh; Gracie Knowlton, 11th; Maghen Saltzman, 12th; Josiah Hopkins, seventh; and Alex Gohr crossing the line in 11th place. Bishop once again earned a place on the podium. Bishop crossed the finish line marred with dirt, sweat and blood on his legs. Bishop is an athlete who puts it all out on the course, and it shows whether one is watching on the sidelines or at the finish. This is his first year with Tehachapi. His hard work, friendship and mild character have been an instant gain for the team. At the end of the day, finishing places are tallied and awards are given to teams based on points. Heritage Oak School from Tehachapi earned a second-place team award as a division 2 school. This weekend wrapped up the second race of the season. The next race will be held once again at Vail Lake in Temecula on March 29 and 30. 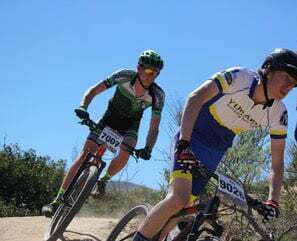 For more information, visit SoCaldirt.org, and for a more detailed results on the Tehachapi team, you can visit the team's Facebook site at Tehachapi MTB. A special thank you to all the team sponsors, including TMTA, Heritage Oak School, Lehigh Cement, Gran Fondo, Lonestar Sierra and Kern Wheelmen. 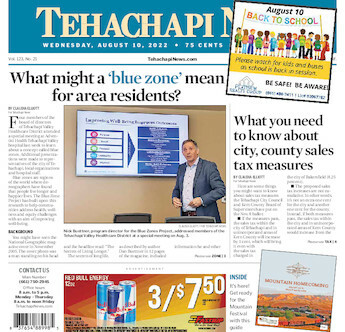 You are the support that make Tehachapi’s mountain bike team a success. April Wood is a parent and coach with the team.